The Odyssey Innovative Design FZTP020W Flight Zone Utility Cable Case (Black) is made of ABS plastic laminated over 3/8" plywood. The case has steel hardware, chrome-plated butterfly latches and recessed, spring-loaded handles. The case also has steel corners and aluminum edging. 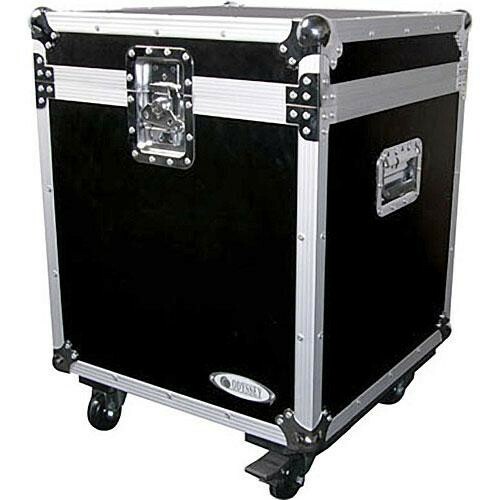 This case meets ATA 300 specifications for shipping cases. Box Dimensions (LxWxH) 32.0 x 24.0 x 24.0"
FZTP020W Flight Zone Utility Cable Case is rated 2.0 out of 5 by 1. Rated 2 out of 5 by obi-ron kenobi from No carpet lining Nice solid case, but it came without the advertised carpet lining. The interior had a lot of sharp edges from the pop rivets used to secure the latches and corner protectors that could potentially cut any cables placed in the case. I had to purchase some indoor-outdoor carpet and line it myself. Took about an hour, a 6'x8' piece of carpet and a pint of carpet adhesive.